• Some of the wrestlers (John Cena etc.) can't perform the secondary running front/rear grapple. • Fix the camera angle during replay in tag team matches. On 360 I did a title vs title match WWE title vs NXT title when the match was over in the victory scene Seth Rollins was holding 2 WWE titles. Also at the end of some matches after the replays on the loading screen it freezes. Anyone on 360 had this problem? 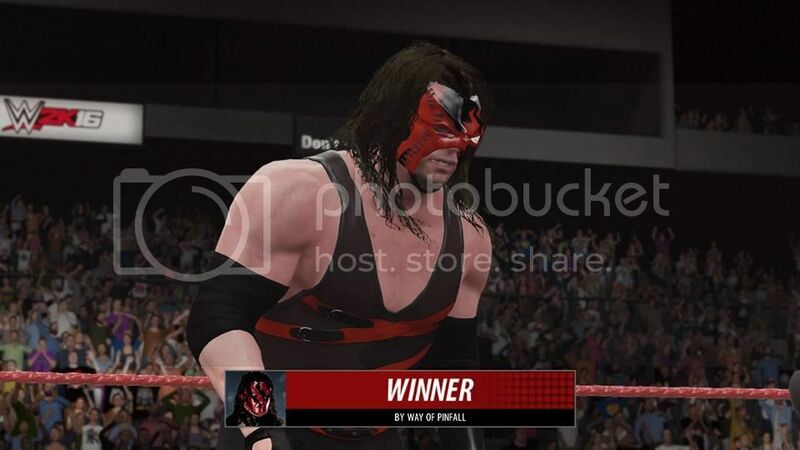 X1: The 2002 Kane mask fits perfectly on CAW mode but in game the bit around the eyes and nose goes out to the point of the tip of the nose. Does anyone else get the run in cut scene glitch? Are they aware of this cause it's kind of spoiling the game for me. I wish I would've kept track of them all ran into at least 20 during a 3 day span. Edited by UNDERTAKER LORDOFDARKNES, 03 November 2015 - 12:57 PM. Might be fixable by just going back into CAW mode and clicking into Hair, but if you change the hairstyle for someone's 2nd attire, it erases any hair dye work you did on the 1st attire. I'll update you on the situation when I get time to play the game again after work. I also recommend another Wishlist/Fixlist topic get pinned now too, since people officially know what all did and didn't make the game this year, as well as things that could stand to be tweaked or fixed. Easier for 2K to look at too...the earlier, the better. Edited by ANTI-, 03 November 2015 - 02:42 PM. The logos on my alt attire CAWs are all screwy after downloading them. In universe mode you choose a city for your show or PPV to take place in. Then the nameplate at the start of each match reads a completely different city. Then, during the show, the commentators talk about how the show is taking place in yet another completely different city from either of the other two. Update- Yep, if you select a different hairstyle for attire 2 than the one you used for attire 1, it erases any Hair Dye work you did in attire 1; the actual hairstyle itself stays, though. Bit of a bummer, as I had done some semi-tedious stuff. It is what it is. Update #2- From what I've seen, ANY Hair Dye you do for one attire ERASES ANY work done on the hair done for the other attire, unless they are one in the same. I feel like that's important info for all CAW makers if it isn't already common knowledge. Edited by ANTI-, 03 November 2015 - 11:20 PM. Can't make title matches in universe. FIX: CAN edit title matches and change participants) PATCH COMING! The way you have this organized this really looks weird. The only patch is for title matches right? I would put that at the top and all others below that. My report is the issues when creating an all divas show, the first match is blank and must be manually created. Has been reported by 3 users. So far. If you give Cesaro an alternate attire, his towel will glitch in the entrance. It goes through his head. When downloading CAW's with texture/image work, you know it's gonna be glitched if it only takes a few seconds to download. most of those take 30 to 45 seconds. When you load these into game, the textures will be misplaced with another image and make the caw totally useless. Hopefully, they'll fix this with the upcoming patch. Rivalries are all jacked up. So apparently rivalry matches are required probably within two weeks and they have to stay as the game set them, no modification. Edited by sephstorm, 04 November 2015 - 12:49 AM. Strike finishers/signatures take priority over any other signature/finisher. For example I can't hit the Rack Attack with Nikki Bella because all she does is the Forearm Smash she won't do the Rack Attack even if I am in position for it and I am clicking the right buttons. I've had the same issues as well si i can confirm these. Ive also had a game breaking glitch during universe that occurred when I gave lex luger the wcw us title before I made it the singles title on smackdown. The game froze and u couldn't access universe mode until I deleted my save data. Edited by CWagz21, 04 November 2015 - 04:14 AM.